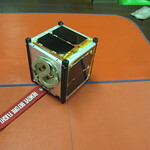 to test in orbit COTS technology and self-made hardware. 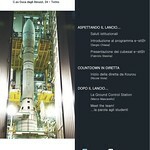 More than 100 students worked on this project, gaining hands-on experience on space applications! 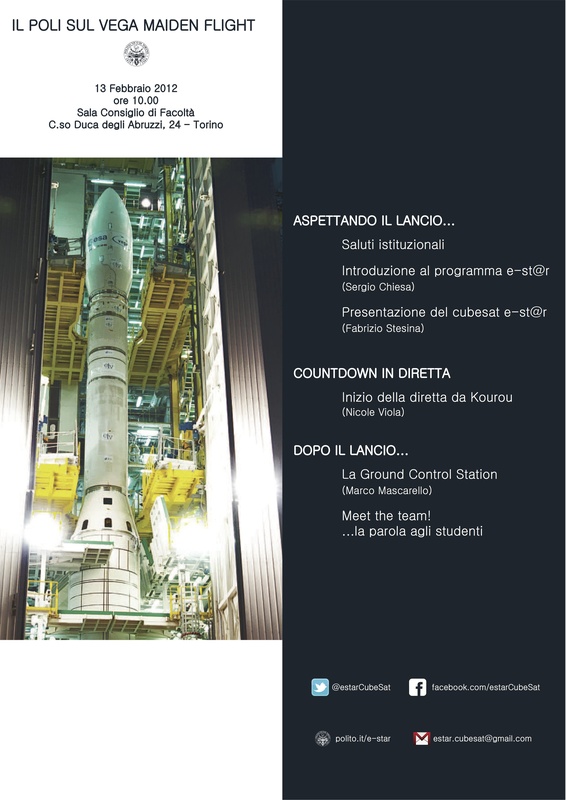 [email protected] is the first Italian CubeSat and the first satellite of Politecnico di Torino to be inserted on orbit. 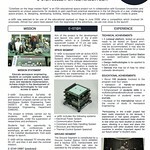 [email protected] is equipped with an Active Attitude Determination and Control Subsystem, based on magnetic actuation. [email protected] bus is the basis of [email protected]: it’s a small step towards future missions and applications. To achieve a complete three axes control, which actually represents the main objective of the mission, the satellite is equipped with a dedicated system. The system must accomplish the following functions: attitude determination and attitude control. To determine the attitude different sets of sensors have been installed on-board for redundancy reasons: coarse sun sensors, three axis magnetometer, and an Inertial Measurement Unit (IMU). 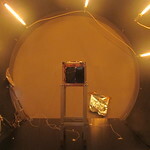 The interest of the experiment relies in particular in the space test of a commercial IMU, while the other two set of sensors have been already tested into space in previous programs. The three axes control is pursued thanks to three magnetic torquers mounted on three perpendicular [email protected] panels. The Telemetry, Tracking and Command system (TT&C) provides the interface between the spacecraft and ground systems. Operators commands (uplink) pass to the spacecraft through this subsystem to control it and to operate the payload. 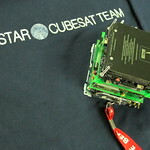 Payload mission data and cubesat housekeeping data pass from the spacecraft through this subsystem to operators on the ground. The system is constituted by a UHF module characterized by low power consumption, small dimensions and low weight, and by a dedicated microprocessor: the system results very simple and robust. The system is continuously operating, transmitting data every two minutes during the nominal orbit. 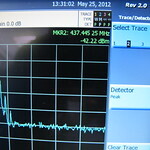 The signal can be received by ground stations located throughout the globe. 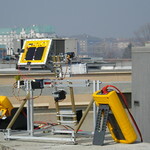 When the satellite passes over Torino, the system can receives commands from the ground station and transmits the extended telemetry data. The communication satellite-ground station uses one channel in amateur radio frequency, at 437.445 MHz, with a bit rate of 1200 bit/s and digital frequency modulation BPSK. 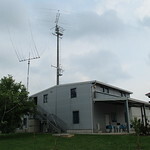 The communication channel is half duplex and it is activated on demand from the ground station. The TT&C system board dimensions are 96 x 90 cm and the global weight of the system (with dipole antenna) is 60 g. The maximum power consumption during transmission is 650 mW in the worst case. The communication protocol has been defined on purpose by the team as far as the commands codification is concerned. On the contrary, for the downlink transmission the standard amateur protocol KISS AX.25 is used in order to share the telemetry data with the amateur and CubeSat community all over the world. In order to collect, convert, distribute and store electrical power, the Electrical Power Subsystem is necessary. [email protected] picosatellite exploits the primary source of energy, i.e. solar flux, to collect the electrical power, when not in eclipses. However, during both eclipses and day-lights it supplies the avionics with the electrical power it needs by means of two battery packages. 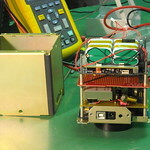 Apart from solar cells and battery packages, the other component of the Electrical Power Subsystem is a dedicated Power Supply electronic board to manage the energy supplied by the solar panels, recharge batteries, distribute the electrical power conveniently regulated and provide the EPS telemetry. As far as the solar cells are concerned, five faces out of six of [email protected] are covered with solar panels. 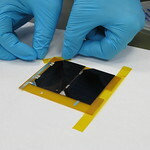 All panels have two GaAs triple junction cells each, which are 70 mm long and 40 mm wide. The cells have an efficiency of 24% (minimum) and they are connected in series in order to supply a nominal voltage of 4.6 V, and a power of about 2.0 W. The cells have been supplied by CESI S.p.A. – Milano – Italy. Power from each of the solar panel is transferred to the Power Bus via three Battery Charge Regulator (BCR), operating independently. Each BCR sets the panel voltage at the maximum power point (MPPT) so that the available energy from the panel is fully utilized. A kill switch to inhibit the supply of power bus during pre-launch and launch phase is also included in the system. Voltage Regulators (VRs) allow to obtain a stable tension used to supply [email protected] bus and all the devices of the satellite with the correct currents. Filters and protection switches to prevent over-currents and over-voltages are used. Thanks to Analog to Digital Converters and the I2C interface (that allows the connection with the [email protected] bus), the telemetry of solar panels and batteries voltages, temperatures and currents and power bus current is available. As far as the battery packages are concerned, [email protected] is equipped with two battery packages, each constituted by two Li-Ion battery cells connected in series. Each package supplies 7.2 V/1800 mAh and both battery packages are mounted on the D-PCDU, which is actually the last board of the series, and are easily accessible. The power consumption of the entire system is less than 0.1 W. The EPS total weight is 250 g and the power board sizes are 96×90 mm. In order to size and verify the EPS, all the operative modes have been taken into account. The maximum daily power consumption estimated and verified for the envisaged elliptical orbit is less than 4350 mW. After the deployment from the launcher, the satellite is in “detumbling phase” and the power consumption is about 6500 mW. On Board Computer (OBC) hardware is constituted by a computer board with a micro-controller MSP430, several memory units, a bus interface (named [email protected] bus) and many I/O pins. 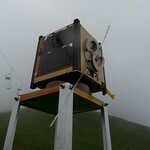 The OBC main tasks are: to create a physical platform to manage the satellite operations, to interface other subsystems and devices through the main bus, to validate, understand and distribute commands, to process, organize and store telemetry data, and to accomplish the watchdog function. 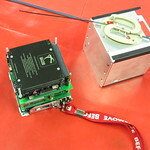 One switch disables [email protected] main bus before and during the launch phase, and it is set to activate the system 30 minutes after the CubeSat is released from the deployer. 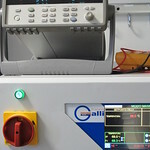 The EPS, TT&C and ADCS are connected via the [email protected] main bus, also to ease the verification activity from the external test equipment. The OBC software is based on a real time operating system, and the microcontroller is programmed in C language. The OBC main board weights 80 g, its dimensions are 90 x 96 mm, and the power consumption is less than 0.2 W.
[email protected] mechanical system meets the requirements settled by Cubesat standards. The interface with P-POD specifications has also been satisfied. 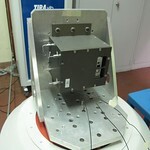 The lateral panels of the satellite have been obtained by a 100×410 mm sheet metal plate, then appropriately folded and closed by means of rivets. The top and bottom panels are basically modified C section plates, screwed to the lateral structure. 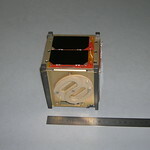 Hence no Multilayer Insulation (MLI) is used on the [email protected] Cubesat. The structural layout guarantees quite an easy access to sub-systems. The structure is devoted to carry the loads induced by the launch vehicle, to support and protect all other spacecraft sub-systems, and to provide for spring plunger devices and deployment switches. 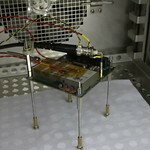 One panel (P1) is equipped to accommodate the antenna and all the connectors to ground test equipment. All other panels are covered by solar cells and related devices. All components of the main structure are manufactured in anodized Aluminium alloy. Vega’s maiden flight, dubbed VV01, took off on 13 February 2012 (it was originally scheduled on the 9th, but then it was postponed by four days). 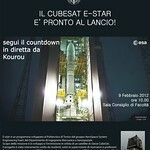 The vehicle lifted off from Europe’s Spaceport in Kourou, French Guiana, carrying nine satellites into orbit: [email protected] and other 6 CubeSats from European universities, the LARES laser relativity satellite and ALMASat-1 from ASI. Final orbit of Vega’s AVUM fourth, and so of [email protected], was an elliptical orbit (1450 km x 350 km, orbital period of 103 min, with an inclination of 69° above the equator). 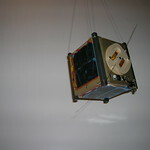 The first contact with the satellite was established, not just after its insertion in-orbit, but few days later. 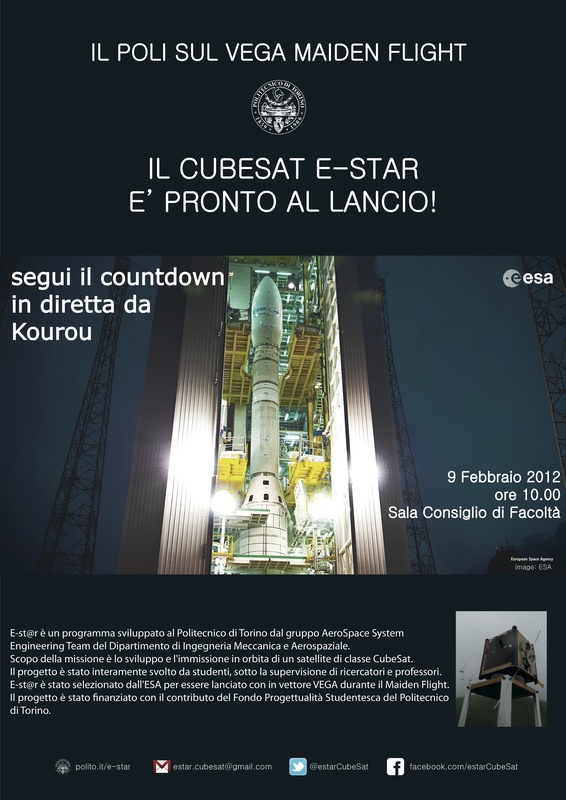 Nonetheless, the contact was intermittent and the team was not able to completely decode received telemetry packets: this was probably due to a very low state-of-charge of the batteries.By the end of 2012 the CubeSat Team of Politecnico di Torino has declared the cessation of [email protected] communications and the end of the mission.On 16/01/2015 [email protected] completed its reentry, so it is no longer on orbit (source).